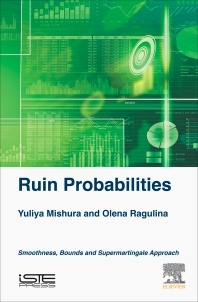 Ruin Probabilities: Smoothness, Bounds, Supermartingale Approach deals with continuous-time risk models and covers several aspects of risk theory. The first of them is the smoothness of the survival probabilities. In particular, the book provides a detailed investigation of the continuity and differentiability of the infinite-horizon and finite-horizon survival probabilities for different risk models. Next, it gives some possible applications of the results concerning the smoothness of the survival probabilities. Additionally, the book introduces the supermartingale approach, which generalizes the martingale one introduced by Gerber, to get upper exponential bounds for the infinite-horizon ruin probabilities in some generalizations of the classical risk model with risky investments. Olena Ragulina is Junior Researcher at the Department of Probability Theory, Statistics and Actuarial Mathematics, Taras Shevchenko National University of Kyiv, Ukraine Her research interests include actuarial and financial mathematics.